Born in Leningrad (St. Petersburg) on 19 September, 1973. In 2008, received bachelor degree in philosophy from the Russian Christian Humanitarian Academy. 2012 – 2017, an assistant researcher, from June 2017, a junior researcher at the IOM RAS, Department of the Ancient Eastern Studies (earlier at the Department of Manuscripts and Documents). 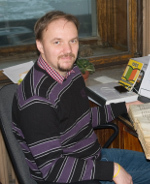 Currently works on PhD thesis “Greek lectionary from the collection of IOM RAS as a source for studies of early Christian liturgy" [“Греческий лекционарий из собрания ИВР РАН как источник по раннехристианской литургике”]. Major research interests: biblical studies, biblical textual criticism, biblical theology, Greek Paleography, early Christian liturgy, early Christian manuscripts, history of Christian churches of the East (Egyptian, Syrian, Palestinian). At the IOM RAS Department of Middle Eastern and Near Eastern Studies, the monograph by Vyacheslav M. Platonov The Manuscript Book in the Traditional Culture of Ethiopia prepared to the publication by Dr. Ekaterina V. Gusarova will be discussed.